I’ll start by saying that my original tramily (trail family) will always be Bruiser, Blue, and Magnot. However, after they finished their section hikes and time passed, I have found myself a new crew to keep for company. J-Bird, Fin, Smiles, and I have now been hiking together for over two weeks (note: the featured image also includes a friend, Carrot Top, who I haven’t seen since Caratunk). From left to right: Smiles, Wildlife, J-Bird, Fin. The first person I met was Smiles. We actually met briefly at the Concord Coach station in Bangor before heading to Millinocket. We were both staying at the AT Lodge that night, but I was starting the following day, while he was going to start the day after that. I didn’t see him again until half way through the Wilderness. Smiles and I really got to know each other through the middle and later half of Maine. The next person I met was J-Bird, who I had heard about from other SOBOs and some NOBOs. 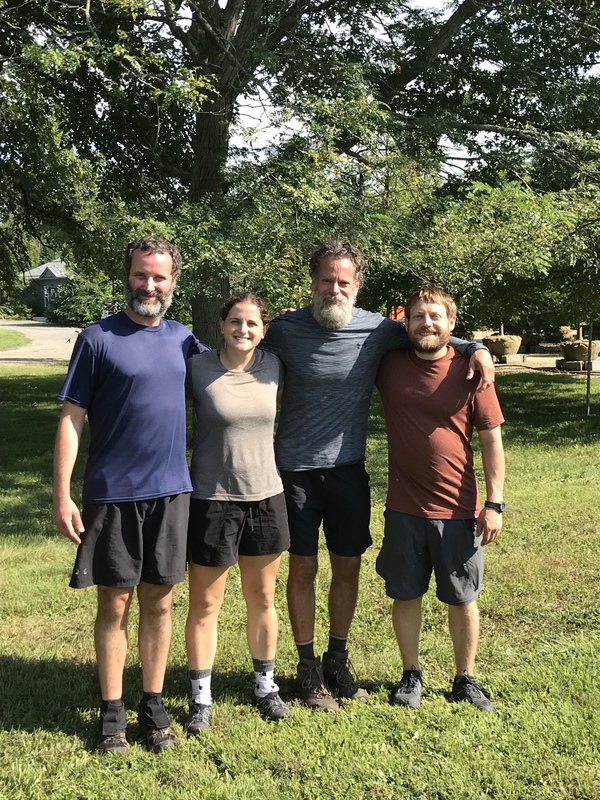 He is a flip-flopper, so he started at Springer, hiked to Waynesboro, flew up to Maine, and has been hiking south from Mama K. He had been ahead of me, but I caught up to him in Rangeley, where we met at the Hiker Hut. From there Smiles, J-Bird, and I hiked quite a bit together. I met Fin more recently. In fact, we didn’t meet until Vermont. It was at the Yellow Deli in Rutland, and he rolled in with another friend, .8. While it was a brief meeting, I saw him on the trail several days later, with a small container of maple syrup strapped to his pack. I remember thinking how genius that was. Later I found out that he actually drinks the maple syrup straight during the day for energy, and I realized how crazy he was. Just kidding, Fin. Toward the end of Vermont, we were all hiking close to each other. J-Bird, Smiles, and I were mostly camping together, but still sort of had our own plans. Then at the Upper Goose Pond cabin, J-Bird, Fin, and I took a zero, along with Woody, for Labor Day. It was a great day. It was hot and humid, so it was nice not to be hiking. We had a great feast thanks to the caretaker and his friend. We all canoed and swam in the pond. Muddy Boots chased some chipmunks. 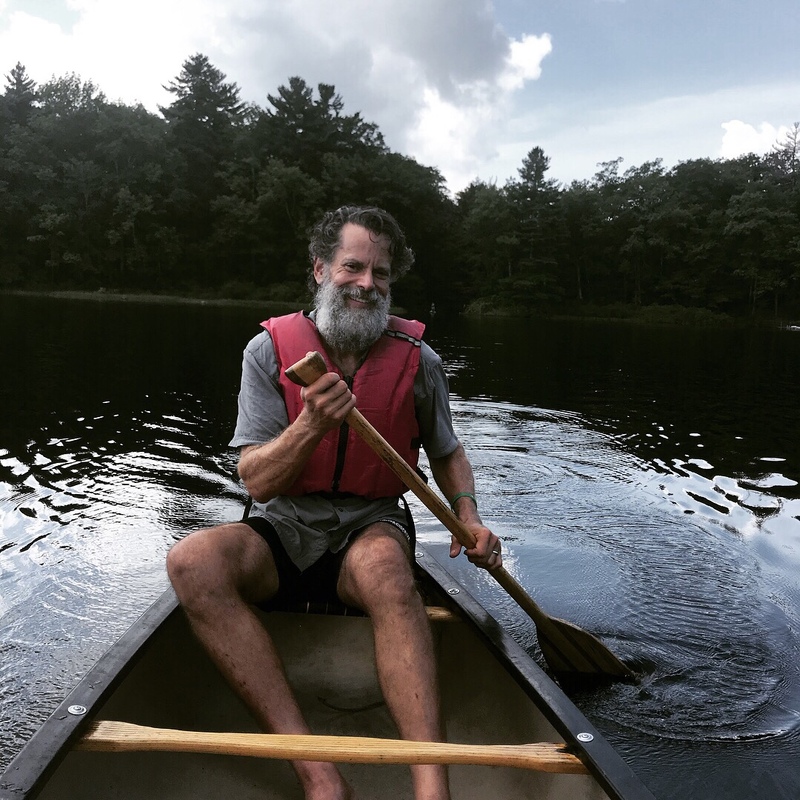 Canoeing with J-Bird on Upper Goose Pond. The next day Smiles caught up, and my birthday was coming up, so I invited everyone to come into Great Barrington with me to celebrate with my mom. The day after my birthday, Lily was getting off trail, and I was desperate not to be alone. The rest is history. We’ve been going along together ever since. The four of us make quite a crew. J-Bird always has great stories to tell. Smiles is compassionate and offers wonderful wisdom and advice. Fin is full of great ideas. And I’m just the estrogen to balance them out. Together, we’ve been through a lot the past couple of weeks. 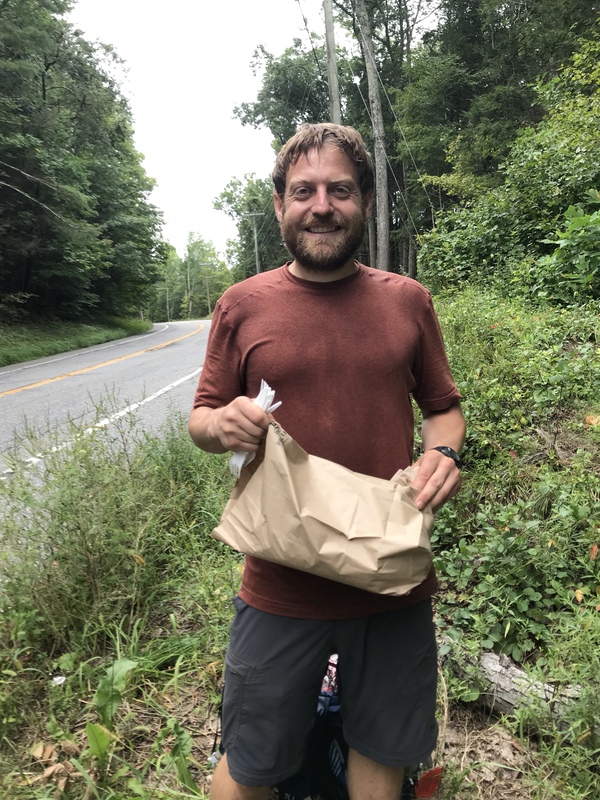 There have been highs–like the time Fin managed to get calzones delivered to the most random road in Connecticut. Fin proudly holding the precious calzones. And there have been lows–such as the day that was rainy and cold, I hiked an extra mile for trail magic that was several days before, and then I broke down crying to J-Bird. Other notable moments include stealthing to catch a sunrise that ended up being clouded in, going to get sushi from the RPH shelter right by the road, J-Bird and Fin getting free massages from a woman in Salisbury, staying at a lovely Airbnb with a great host in Pawling to get out of the rain and cold, and mostly eating lots and lots of food. While we’ve become quite close, the tramily will eventually have to go separate ways. As a flip flopper, J-Bird will be wrapping up in Waynesboro, VA, where he flipped from. Smiles has to get off trail to visit family for a few days, and I’m starting to sense that I may need some time on my own. However, we are still enjoying each other’s company, and who knows, maybe more friends, like Woody or Carrot Top, will get in on this tramily action. So awed and proud of my amazing courageous strong and talented niece Wildlife! Love the stories Emma, I can’t begin to imagine how it feels during the highs and lows. Guessing everything must be more intense on the trail. Keep the blogs coming! Seems like a wonderful group–Tramily. We miss you, but you are inspiring us all! Love you to to the Blue Ridge Mountains and back! I was part of the hiking group from Teahorse Hostel in Harpers Ferry. You are a celebrity to all of us!! I hope you were able to find some company on the trail this week. We have finished our 4 day hike and now have even more respect for any thru hiker. I am looking forward to following your hike here!! Thanks Valerie! It was so nice to meet you all!